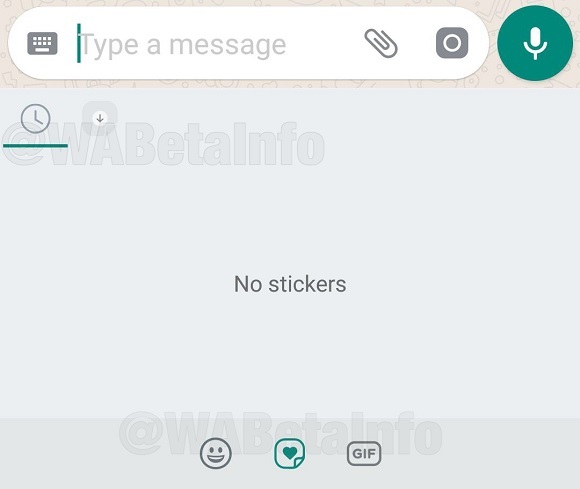 WhatsApp beta for Android 2.18.12: what’s new? WhatsApp has submitted a new important update through the Google Play Beta Program: the version is 2.18.12. We never started to write an article indicating an update as important, but this time we had to do. Let’s find out together why this is an important update, analyzing what’s new ..
We talked so many times about Stickers. The first time we wrote an article, publishing a screenshot about how a sticker looks on iOS, also showing to you what were the supported Facebook stickers pack. 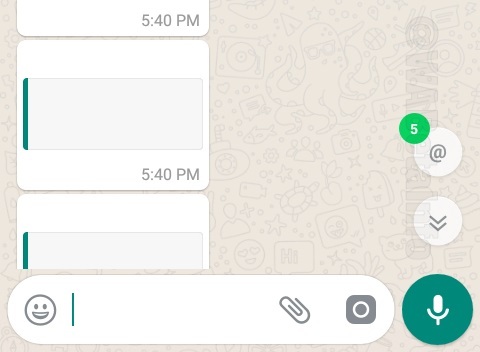 Then, we wrote another post about an old WhatsApp for Android changelog, where we talked about sticker reactions and where the main sticker tab was located. If you also follow our Windows Phone news, you have surely noticed that we also showed the first UI references about Stickers. Today we are finally able to show you the first supported Facebook sticker pack on WhatsApp for Android! This is under development, so it is not visible yet updating to this version. Thanks to the 2.18.12 update, we discovered that it will be Unchi and Rollie, already implemented in Facebook and Messenger. 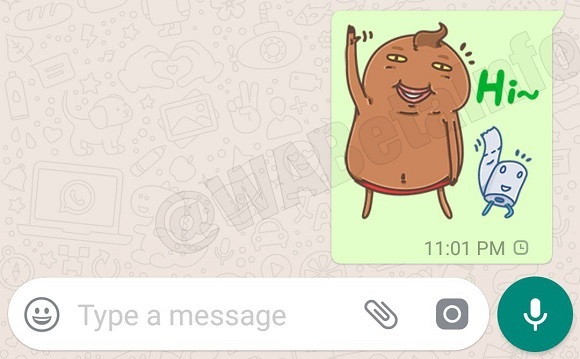 This stickers pack confirms that WhatsApp is going to implement Facebook stickers in the application, but now let’s see better this in WhatsApp for Android. When you will try to send a sticker, it will look so in the bubble. Note that, as above mentioned, there will be a store, like in Facebook Messenger, where you can choose which stickers packs you want to download, and actually in the store there are only Facebook stickers. Also if you don’t save a specific stickers packs, you will be able to receive all other different stickers in the chat. Note again that this feature is not available right now. WhatsApp needs to improve the feature, so it will be available for you in next updates. 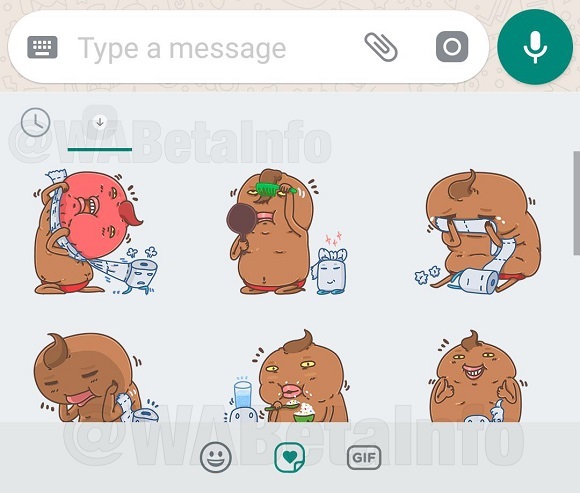 In the meantime, WhatsApp will add many other stickers packs: so, when the feature will be enabled, you will be probably able to use all Facebook stickers packs. Some days ago we talked about the mentions notification feature in an iOS article, and finally in this new beta update it has been possible to get the feature also on Android. The mention button will appear when you open a unread group chat if there are messages that contain your mention, not immediately visible in the chat. Every time you press that button, WhatsApp will directly view the next message where you are mentioned. This feature is under development, like the sticker one, so it’s normal that you cannot use it updating to the 2.18.12 version. You need to wait the next updates and it shouldn’t require a lot of time. Since the 2.18.11 update, if you open the Verify security code section and the Security notifications option is disabled, WhatsApp will ask you if you want to enable it. The demote feature is officially enabled since the 2.18.11 update. If you are an administrator, check this option in the Group Info section, tapping on the name of another administrator. More information are available in this post.